QuiltCon (which is the annual event for modern quilters) was this past weekend. I didn't go but I perused the hashtags instead. I also started a baby quilt (and nearly finished, I'm sooooo close). Here's one of the blocks I made. 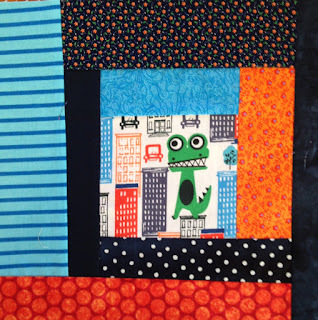 Scrap quilts are so awesome. I can tell you where every single fabric came from and what it was used for previously.